2 Comments on Yo, that’s dope! It emerged that two of the fastest men in the world; multiple Olympic and championship medal-winning athletes, America’s Tyson Gay and Jamaica’s Asafa Powell who’s 100m record was broken by Usain Bolt (no introduction required), have tested positive for banned substances. 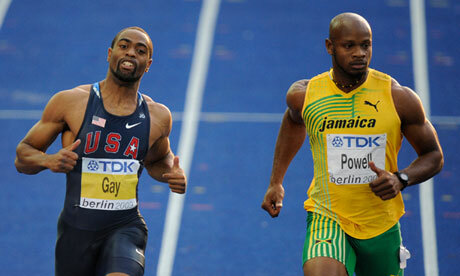 Tyson Gay tested positive for an unnamed substance from a sample submitted in May. This situation is quite sad, especially because both are very successful, but now I wonder how much of that success is actual talent? Being an athletics fan, for a split second I thought this couldn’t be true, but the science rarely lies when it comes to doping tests and neither athlete has denied the results. Powell admitted to testing positive for the substance oxilofrine (I know what you’re thinking, oxi- what? ), a banned substance, and 2004 Olympic 4x100m relay silver medallist, Sherone Simpson also admitted testing positive for a banned stimulant. The Jamaican Anti-Doping Commission (JADCO) confirmed that both athletes along with three others had tested positive for banned substances. Oxilofrine is an anti-hypotensive drug; initially developed to treat people with low blood pressure, who have failed to respond to other drugs. It is found in certain nutritional supplements and works as a stimulant that is believed to increase alertness and burn fat quickly. All this could just be an unfortunate mistake by the athletes involved but even if they trust others to take care of what they ingest; the list of banned substances is publicly available. Maybe it ‘s time for athletes to know exactly what they are ingesting; if this means them becoming part-time food scientists, then so be it, after all their bodies are their temples and their livelihood! The trainer of Asafa Powell and Sherone Simpson seems to be getting the blame, after Italian police allegedly confiscated illegal supplements from his room…but who knows! I don’t want to believe there was any knowing intent on the part of the athletes because I thought they were / are amazing talents, but ‘positive’ is ‘positive’ and under the rules of the sport, if the tests don’t lie then… that’s dope–ing! It’s hardcl to trust anyone anymore these days. Previous Entry What do you call it… urban? Next Entry Bag this one up please!